The latest project from freelance creative technologist Natalia Rojas really puts the term “social network” into perspective. 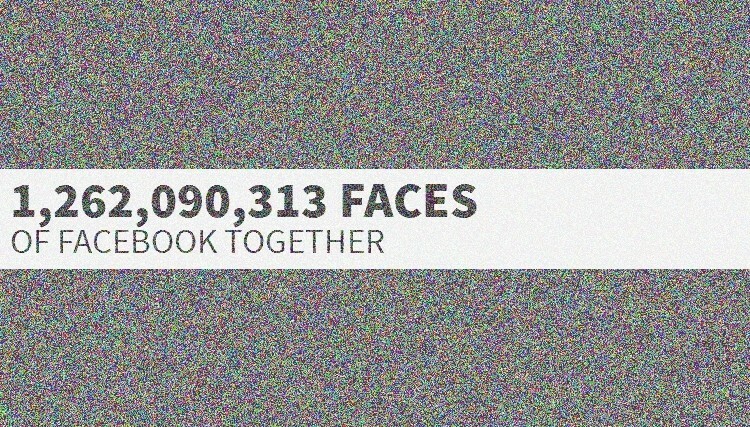 Known as The Faces of Facebook, the site creates a snapshot of every Facebook profile photo – all 1,262,090,313 of them (and counting ) – and displays it at one giant, interactive image that looks more like television show than anything else. Individual pixels in the Facebook mosaic can be clicked for a zoomed-in view of the few hundred or so profiles in that area. Clicking an individual profile photo will take you to that user’s public profile. Each profile is listed with a Face number in chronological order corresponding to when they joined the social network. True enough, Facebook founder Mark Zuckerberg is listed as Face #1. If you have a profile on the site, your profile photo is somewhere among the1.26 billion+ images. Rather than trying to hunt down your Face number on your own (good luck), you can simply click the location marker at the top right of the screen to sign in with your Facebook credentials. From here, you’ll be given your Face number and can share it on your Timeline. Even if you aren’t on Facebook, it’s an interesting enough concept to spend a few minutes checking out.